As you navigate through our tips for frugal living, we want to continue to give you practical ways to save money on everyday items like this Easy Frugal Homemade Fabric Softener. Not only is this super budget friendly, it is a lot of fun to throw together and use. There are so many scents to choose from that you can have experiment to see which you prefer. Great low cost fabric softener is something that every house needs, but can get costly in a hurry. This option works wonderfully while helping you stay in your household budget. There is nothing like opening a drawer and pulling out a fresh smelling t-shirt to wear. This homemade fabric softener costs less as little as $2 to make if using items from your local dollar store, and easily makes a full 2 quart container. This will last through multiple loads of laundry and become one of your favorite homemade cleansers. One of the best parts about making this frugal homemade fabric softener is the fact that you can use coupons to grab both the hair conditioner and vinegar for cheap or free. Hair conditioner is on sale routinely, but vinegar is most frequently found at great prices in the late spring and summer months. Take advantage of these sales and coupons to stock up for future cleaning needs. Note: Vinegar will be the base in a lot of our recipes shared for household cleansers this year, so grab extra when it is super cheap or free. 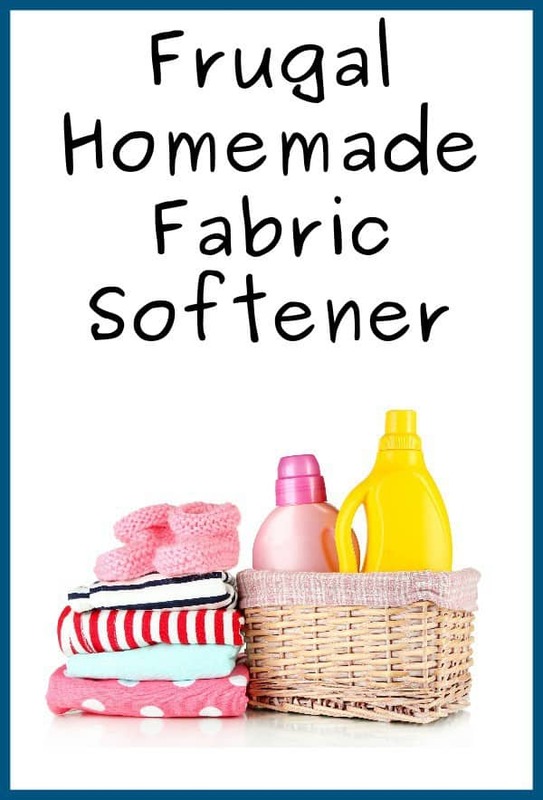 Have you made your own fabric softener before?